PowerDsine 3012 - No. of Ports: 12, Data Rates: 10 Mbps, Connectors: Shielded RJ45, EIA 568A and 568B, Fully compatible with the IEEE 802.3af standard. PowerDsine's Power over Ethernet (PoE) 3012 midspan offers a cost effective, fully IEEE 802.3af compliant solution for remote powering of Wireless LAN access points, as well as other low port density PoE installations. The 3012 PoE midspan eliminates the need for external power supply and its associated AC/DC power cabling, providing a compact, affordable, safe and reliable power solution for small enterprises. 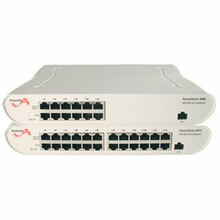 The PowerDsine PD-3012/AC is also known as PDS-PD3012AC	or PD3012AC	.